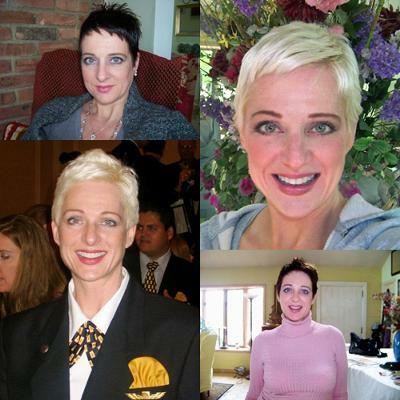 I have gone from brown to blond a few times, I am a natural blond level 6 lightest brown/dark blonde. I am a flight attendant now but used to be a hairdresser. All products can be purchased at Sally Beauty supply. Don't Panic, and get a good hat or wig on hand just in case it takes more than one day to get to the proper shade of blond. Buy two boxes of everything if you have long hair. Attempt this at your own risk, however you can successfully do this without the expense of a hairdresser and many are not good with corrective color, so I find you are often better off on your own. Be prepared to visit a salon after for a less expensive trim if your ends get damaged. 1. If your hair is really dark or long (below shoulders) this process could take a week or at least a weekend so be patient the alternative is really damaged broken hair. 2.One or two depending on length boxes of Sally Beauty One N Only Color fix hair remover. 3. Clairol 7th Stage cream hair lightener- lifts up 8-10 levels with a double drabber to take away brassy tones and can be used on the scalp. 4. Clairol 7th stage borne blond activation crystals. 3. Clairol 20 Volume professional developer. 4. Clairol Cream Toner in 301D White Beige. Step1: Products in hand, vaseline around hairline to protect for irritation, use the color fix according to directions, repeat up to 3 times to remove color I recommend 2 times only, because you are going to bleach to lighten from here, you basically just need to remove the old color only. If step 5 darkens your hair slightly skip step 5 or repeat steps 2-4 if your hair re-darkens slightly with step 5. My hair darkend a little so I skipped this step second time around. Your hair will be in the orange family this is normal while not attractive..that is why the hat and or wig if you decide to do this in two day steps. If your hair is in reasonably good condition and not breaking go onto the next step if you have major breakage (you should be ok if your hair was not too damaged before the dark color was added) continue the next step after 24 hours. Step 2: According the the directions on the back of the bottle add 4 oz of 20 vol Clairol Professional developer to applicator bottle add packet of activator crystals shake well and then add 2 oz (whole bottle) of 7th stage cream developer and shake lightly. Apply to your hair roots to ends starting at the nape of the neck and work your way up to the crown and sides, make sure it covers every where use a mirror to check the back so you don't have black or brown spots when you are done. Check hair every 10 minutes until hair is a pale yellow stage. this mixture stays active for up to 90 minutes. The longer you leave this on the more damage and while you may have to leave it on a full 90 minutes less is best. My advice is if you have the time make this a two to three day process for the healthiest hair results. If after 90 minutes your hair is not pale yellow stage wash and condition hair with your regular conditioner and if your hair is still in decent condition towel then use hair dryer on cool until hair is dry and remix a new batch of lighter mix and reapply until hair is at the pale yellow stage. If hair is breaking or looks loose and frail wash and use the Queen Helene Hot oil for 30 minutes then the Cholesterol hair conditioner for 30 minutes in plastic bag air dry hair or hair dryer on cool and wait 24-48 hours to reapply bleach 7th stage lightner. Depending on your natural color hair one or two applications will be necessary. Step 3: Once hair is at the pale yellow stage, shampoo hair and gently towel dry to a damp stage mix 2 ounces of the Clairol cream toner 301D White Beige with 20 ounces of Clairol cream developer let stay on hair for 15 minutes then rinse and condition with cholesterol treatment and next time you shampoo (wait at least 24-48 hours) use the Queen Helene Hot Oil then Cholesterol back to back, rinse and style as usual. The above steps should leave your hair a soft Ivory Pearl Platinum that is not too white and not yellow. See attached Photos of my transformation of color. FYI While my hair is very short and this makes it easier to color, it also increases the risk of damage and the liability of shorter hair if a trim post coloring is needed. If after the color remover your hair is lighter than the end result color you want you can re-color at this point with the darker shade of blond, to down play orange or brassy tones choose an ash blond or one with a blue or violet base. If you love dark golden blond use a hair color with a name like dark golden blond, medium golden blond and you are safe at this medium orange stage to go medium to dark red just make sure there is brown in the color to replace lost hair pigments, colors like auburn and mahogany are good choices. If you want to go slightly lighter blond at this stage and your hair is healthy wait 24 hours for your scalp and hair to give them a break an try a high lift blond shade with a natural or ash base for Clairol Premium color sold at Sally beauty is a good one to try mix 2 oz Clairol High Lift Coolest Blond (to counteract gold or red tones from the color remover) with 4 ounces of Clairol 40 Vol. Creme developer and get 5 levels of lift from your current post color remover color. Hope this helps and if all else fails don't hesitate to call a salon for a professional consultation. Your cut and bleach/color is HOT. Looks like you did a great job. Not sure how old your post and pics are but still a great job. C.) its okay to go with days in between. my hair doesnt seem to be resenting the bleaching too much. I'm doing this in 3-4 stages... and i'm ok with it now that i've read your post. By the way, i'm going from brown to blonde and my hair is about elbow length... so i obviously want to maintain the length and amount. It was very nice of you to post this up, it helped me very much.. Thank you once again for your thoughtfulness.